I took a zodiac boat tour of the Na Pali Coast thirty years ago, give or take. I still remember how majestic it was, from the slippery seat of that tiny boat. 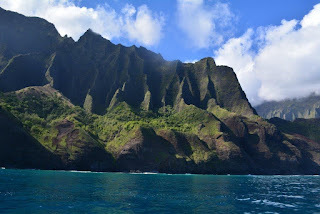 This visit, we timed the weather well, and scheduled a boat/snorkeling tour from Hanalei. The boats are bigger now, and there was even a toilet! Thank gosh I didn't need to use it. What a stunning morning we had. Lovely crew, the rest of the group wasn't too irritating (except for the young woman who styled herself a supermodel), and gorgeous views. Spinner dolphins trailed us for a while, and turtles greeted us languorously. It rained coming back to Hanalei (of course), but the sun was out once we docked. And rainbows, as it should be.